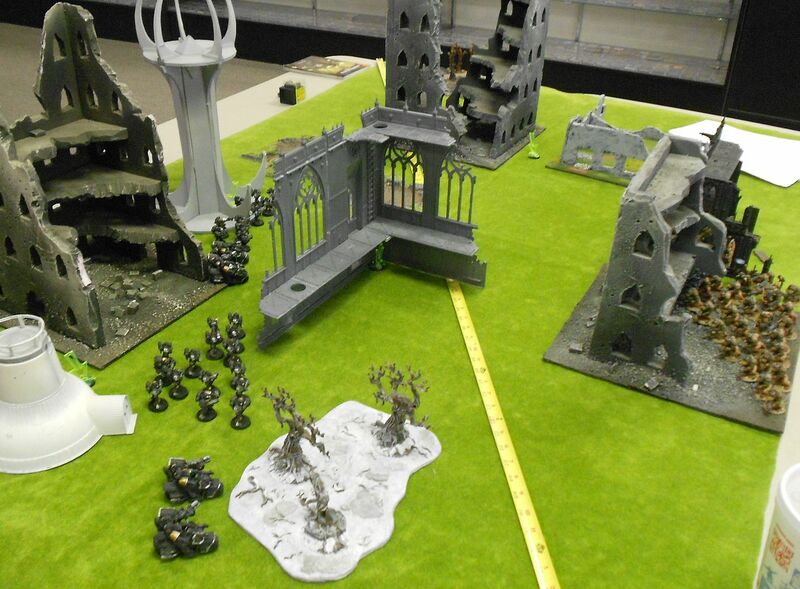 My second round for the 40K league was against Landon and the Hammers of Ornus Space Marines. Still 750pts, this time Big Guns Never Tire/Vanguard Strike. I took a similar list to before, but dropping the Killa Kans to get the points to use the recently-painted (but still unfinished) Dakkajet. 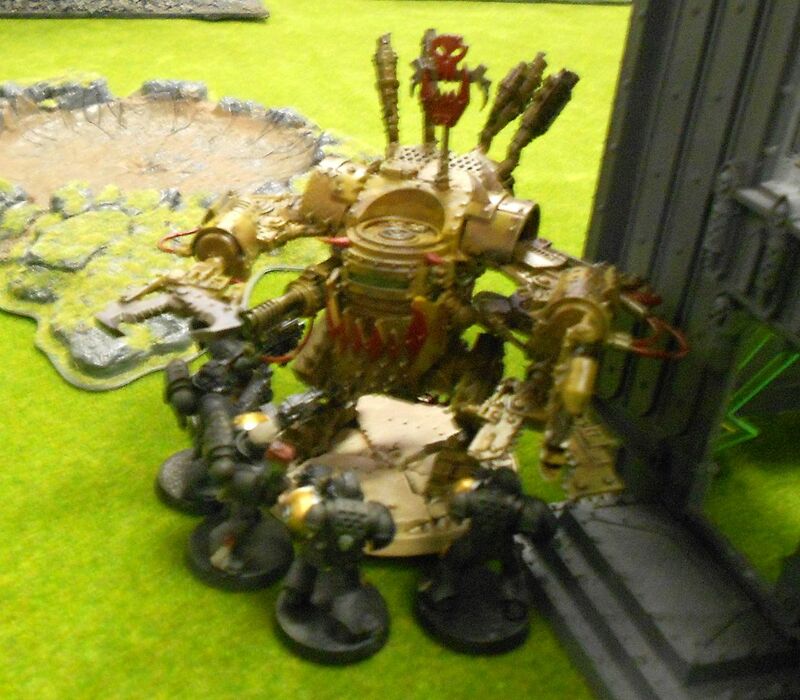 My deployment above - big boys squad with Big Mek, Dread, lobbas. 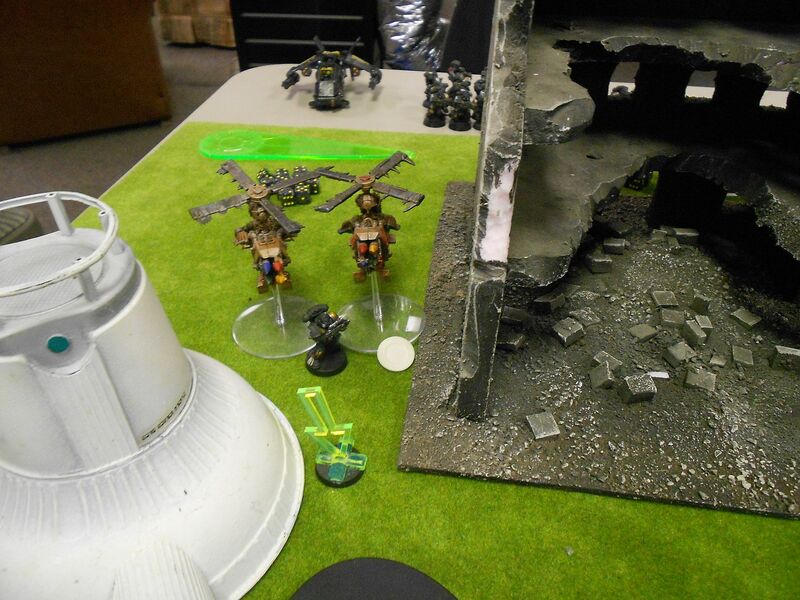 Ork reserves: Dakkajet, outflanking koptas, weedy grots for late objective run. Map at deployment. 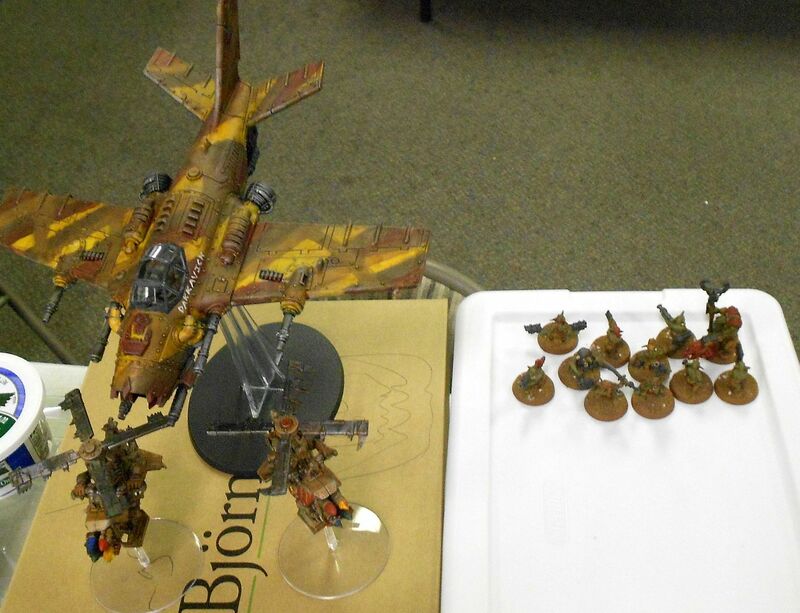 Marines had two full squads (flamer, HB) and a half-squad (sgt plasma pistol), two units of two attack bikes each (one HB, one MM) and a storm talon gunship. Hmm, didn't notice it at the time, but I'm pretty sure that put his fast attack at well over the 30% restriction for the league, which would be a 225pt cap at this level. Oh well; I probably would have had a harder time with a predator instead of the HB bikes anyways. 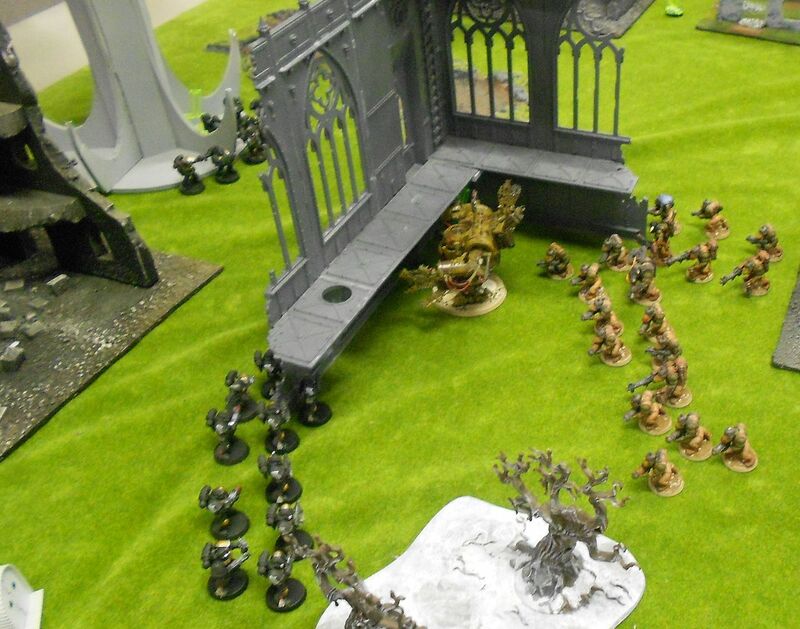 Orks and marines form lines and advance upon each other. Attack bikes spread out on flanks. 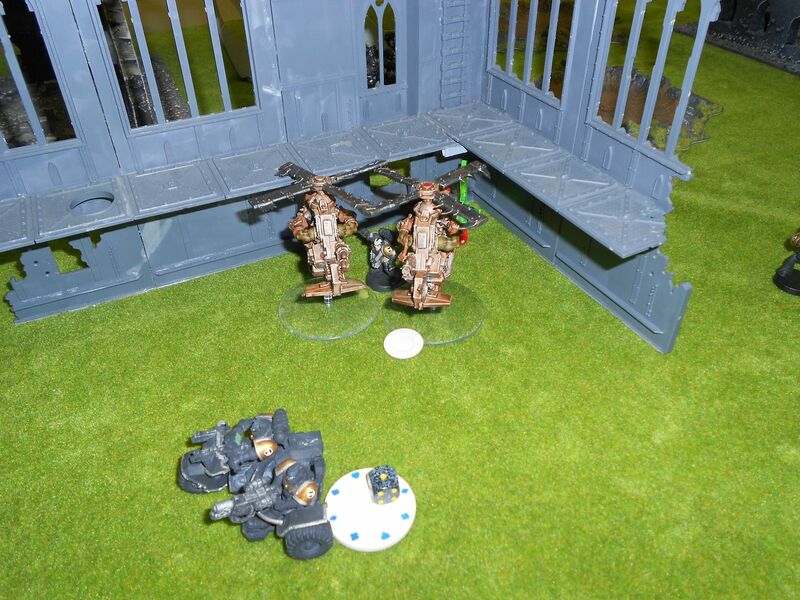 The SQUiG-15 arrives, blasting away at the multi-melta attack bikes, killing one. Koptas arrive, take a wound off of the HB attack bikes. 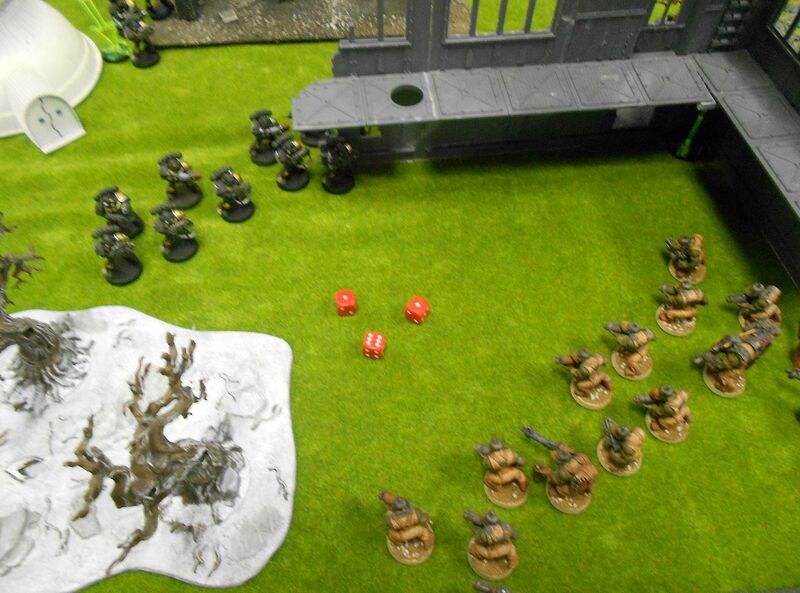 Marines shoot up Orks. 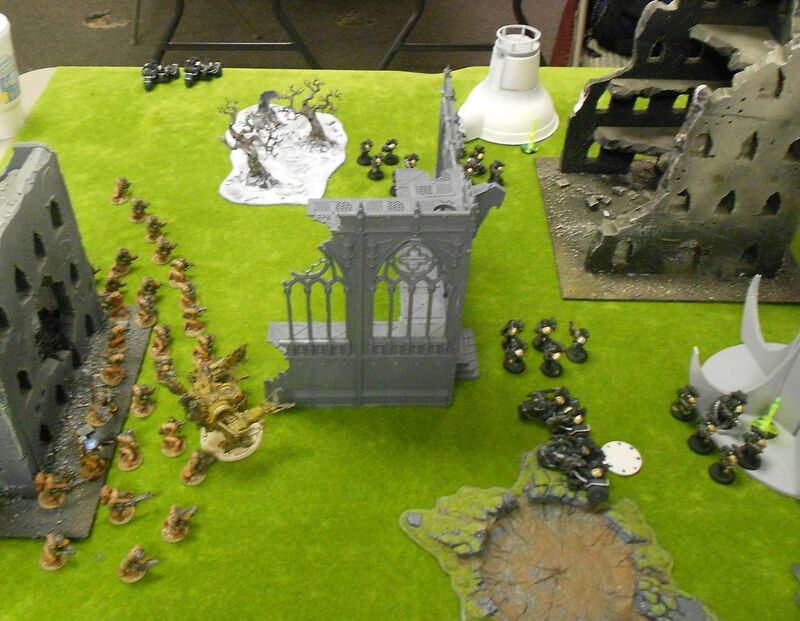 Orks move up and try to charge, getting rerolls from the Waaagghh! Initial roll 3,2,1, reroll even worse! 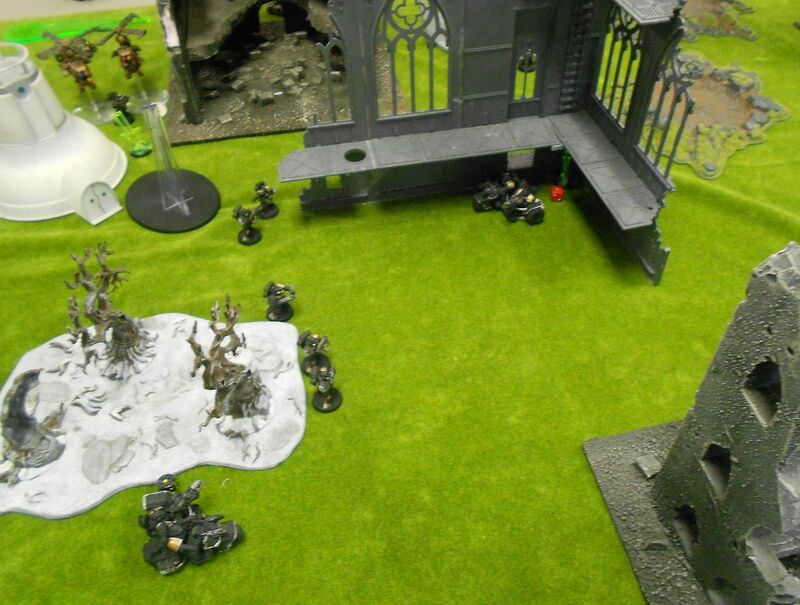 On the other end, the dread makes it to a combat squad and snips three in half. The other two flee to regroup soon after. 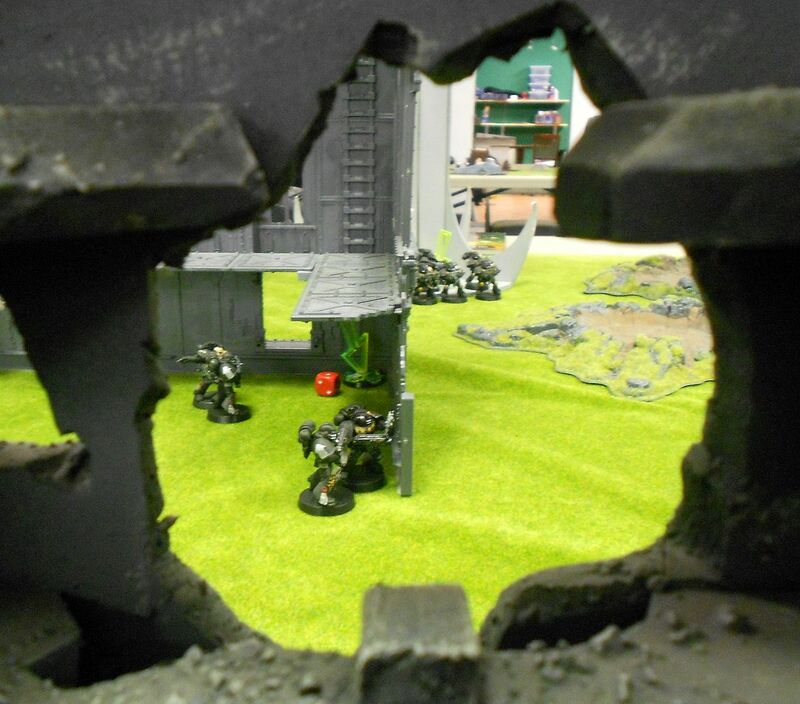 Dread consolidates back behind a wall to limit return fire. Ork squad chopped down to almost nothing while the dakkajet flies over to try to help and koptas shoot up squad on objective. 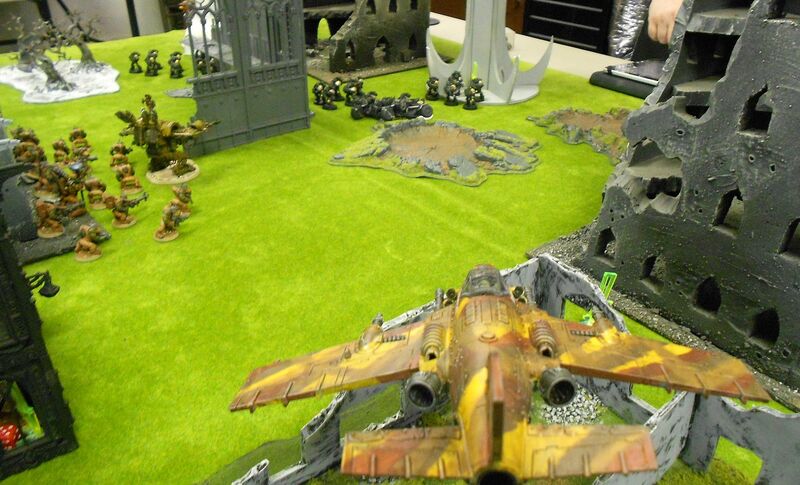 But the Ork reign of air supremacy is short-lived as the storm talon arrives! 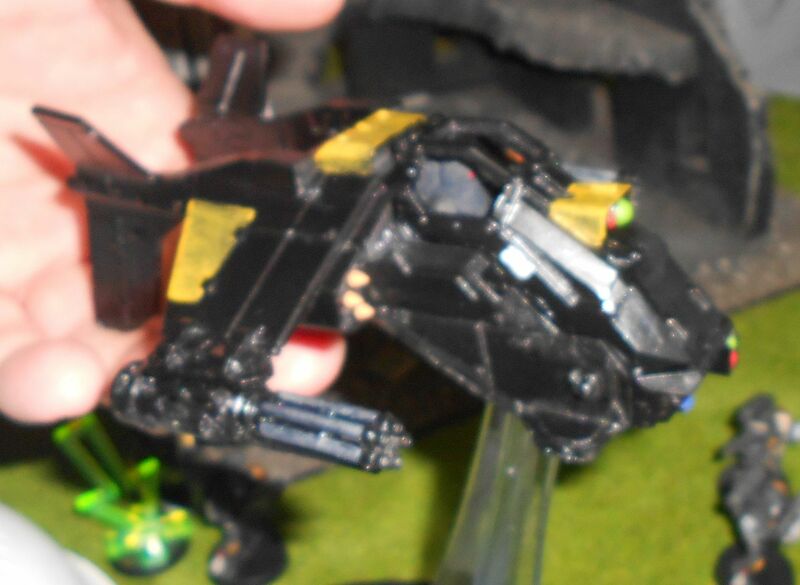 The stormtalon is represented by a Puppetswar flier, which is a pretty cool model! He's still working out how to position it on a stand, so for most of the game we just used the flying base. 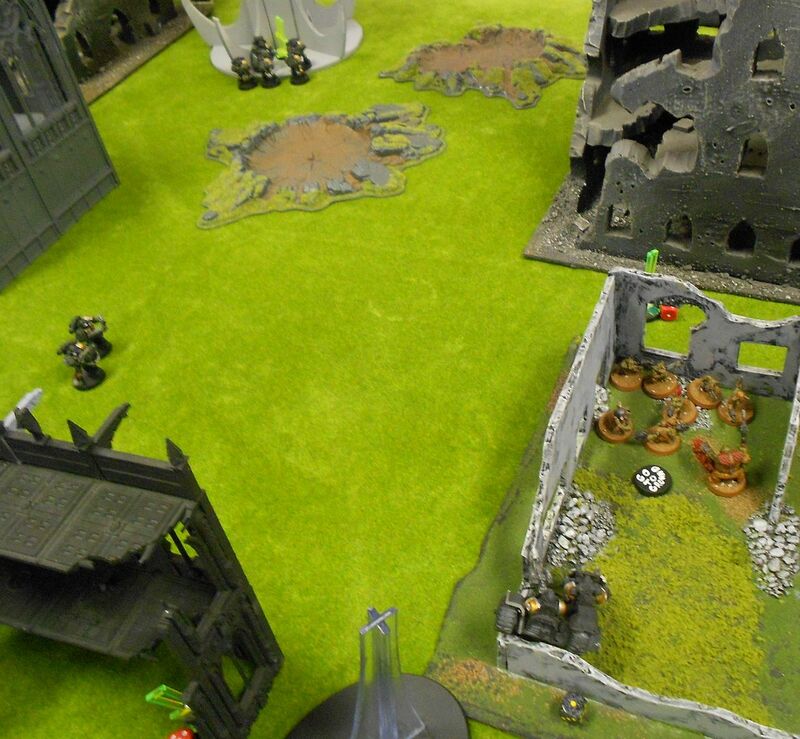 Bad turn for the Orks! 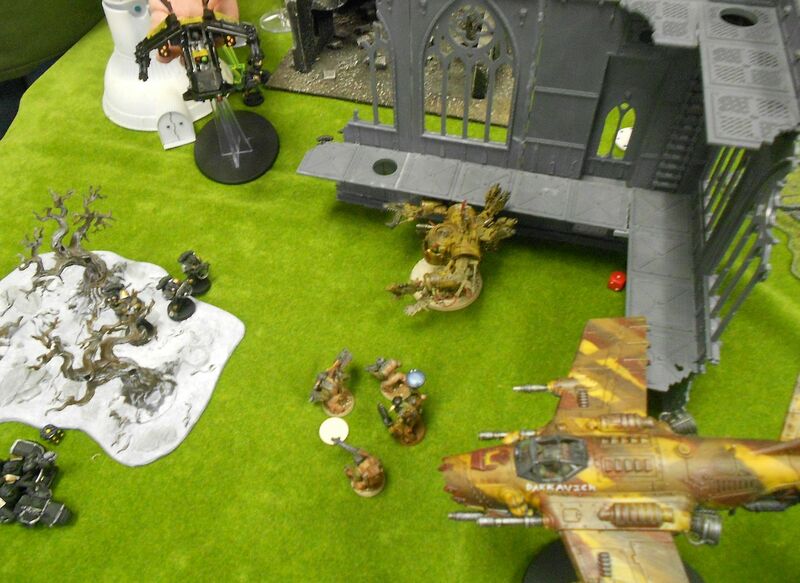 Stormtalon downs the dakkajet, which crashes into some marines but fails to kill any with the kamikaze attempt. 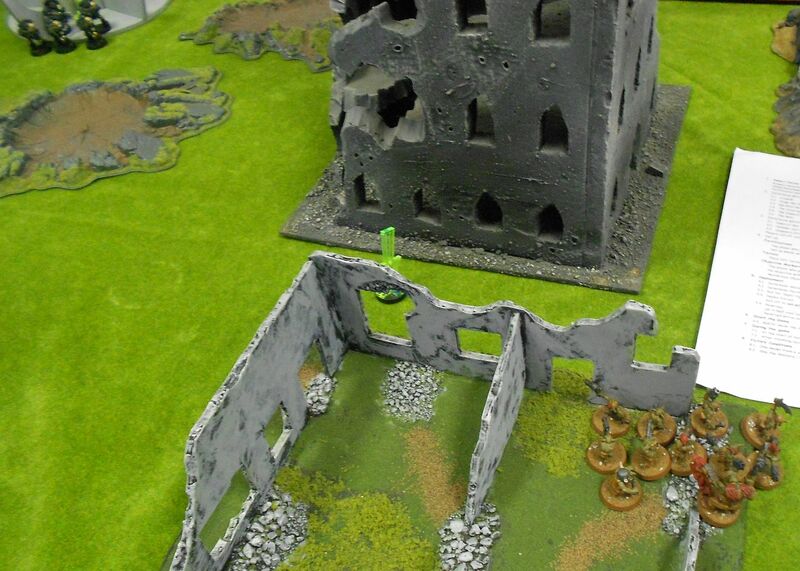 Dread gets multimelta'd in the back and remaining Orks cut down by bolter fire. 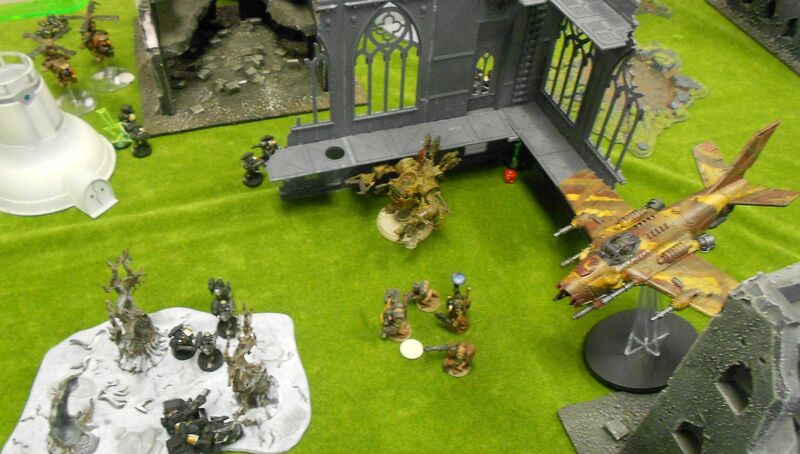 Dakkajets engage the marines in assault, eventually finishing off this combat squad. 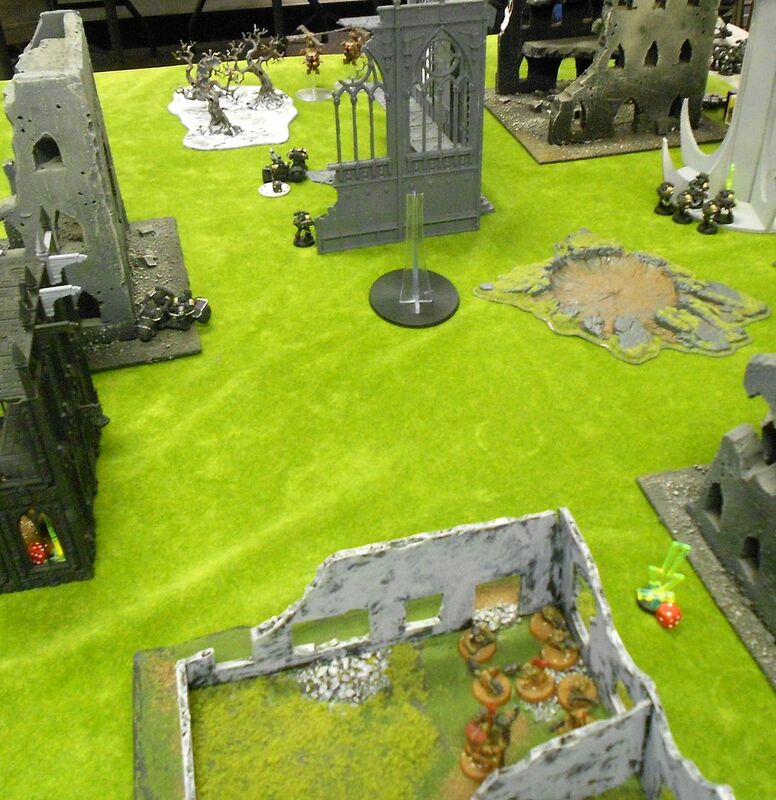 Grots maneuver towards an objective, trying to stay out of bolter range. 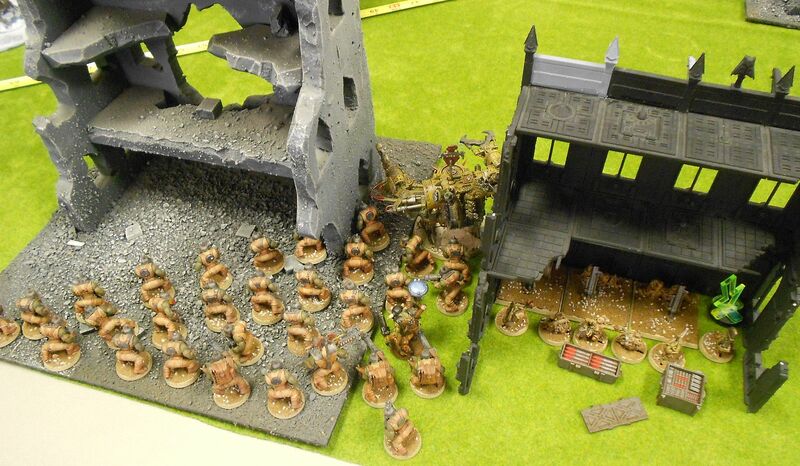 Marines pour fire towards grots who try to hang on while koptas reposition and pop off rokkits. Marines take up positions around objectives. Attack bike assaults into the lobbas! The grots put up a valiant resistance...for grots...but are soon put to the sword. 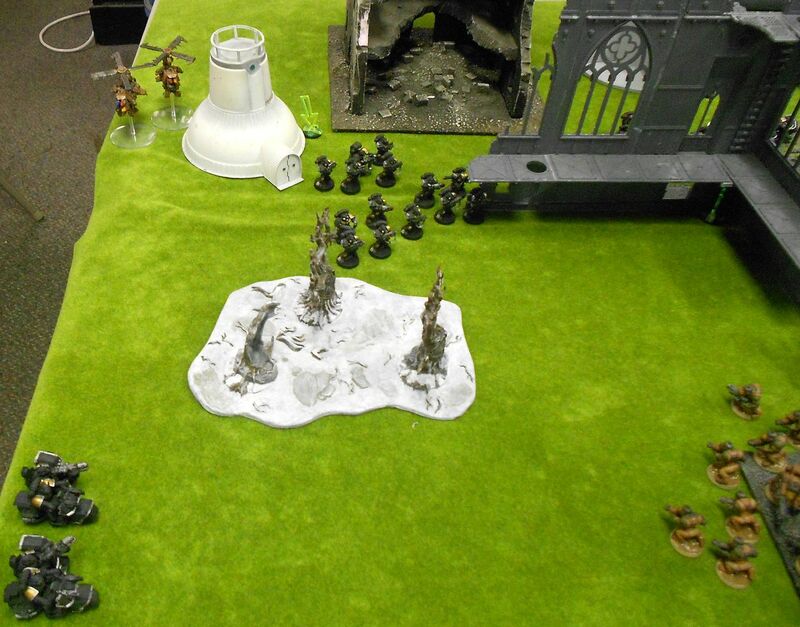 Koptas assault to contest objective. Attack bike joins in soon afterwards, slap fight ensues. Attack bike powers over and assaults the gretchin, pulling them away from the objective and wiping them out after a few rounds of combat. 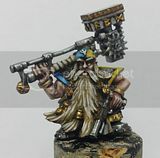 Crushing victory for the Hammers of Ornus! Oh well! 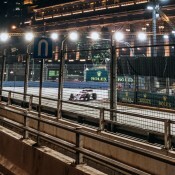 Win some, lose some! Landon is always a tough opponent, and I knew when I saw so many 3+ wounds across from me that I was going to have problems getting through them. The dakkajet was fun to use, but I think I would have been much better served by the killa kans or some meganobs. So who will it be next? Daemons? Grey Knights? Soul Drinkers? Squats? Stay tuned!